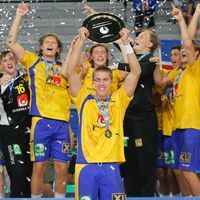 Sunday evening’s Men’s 18 EHF EURO Final between Sweden and Iceland was a topsy turvy affair, which ended with a 32:27 win and gold medal for the Swedes. Only one team turned up for the opening 15 minutes as Sweden stormed into an 8:2 lead, but Iceland have been impressive throughout this championship and were not going to give in easily. Iceland fought their way back and drew level at 12:12 just before the break, leaving the final beautifully in the balance. The third quarter of the match remained tight, before Sweden stepped up a couple of gears. With the score at 21:20, Valter Chrintz and Ludvig Hallbäck took over, like they have so often, scoring 10 of the next 11 goals for Sweden and Iceland simply had no response. Sweden’s 32:27 win was their second at this level and their first in 21 years. Earlier that day, Denmark claimed bronze with a 26:24 win over host nation Croatia.